The sixth edition of this highly respected text is comprehensive yet accessible, with real-world case studies to ground you in the application of important concepts. Written with authority by authors steeped in the financial world, the book offers a comprehensive survey of the theory and practice of corporate finance for anyone studying the topic by itself or within business, accounting, finance, banking or economics courses, teaching you how to make informed, successful financial decisions that are crucial for a career in business. 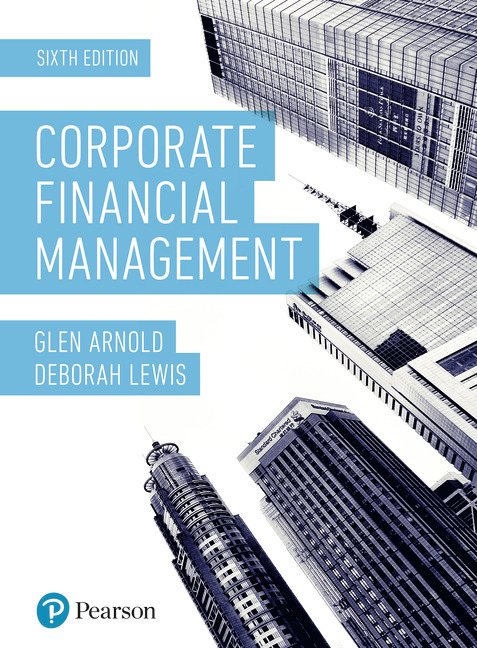 It explores topics such as investment appraisal, risk and return, sources of finance, and risk management, including derivatives, and gives a unique treatment of corporate value. Financial techniques are illustrated in practical terms, using clear accessible language. Glen Arnold runs an investment fund and previously held positions as professor of finance and professor of investing. In addition to the textbook Modern Financial Markets and Institutions he has authored leading investment and banking books including The Financial Times Guide to Investment, The FT Guide to Banking and The FT Guide to Value Investing. Deborah Lewis is a Senior Teaching Fellow at the University of Bath. As Director of Studies for the Bath MBA programme, which features in the top 100 of the FT Global MBA 2018 Ranking, she ensures the material is useful for both the student and the practitioner. Deb’s previous commercial experience allows her to blend academic theory with professional application. MyLab Finance is not included. Students, if MyLab Finance is a recommended/mandatory component of the course, please ask your instructor for the correct ISBN and course ID. MyLab Finance should only be purchased when required by an instructor. Instructors, contact your Pearson representative for more information.